There’s a word I’ve been religiously avoiding using in all my conversations, and writing about this experience, and the word is this: infertility. I avoid it partly because our doctor is yet to use it to refer to either of us (medically, officially, you are only allowed to assign it after a couple have tried for at least one year without success), but also because of all it signifies: personal failure, pathology, brokenness, and the finality of all those things. However, when you’re hanging around at the end of the fertility spectrum that my husband and I currently are (and, yes, believe me, it’s a spectrum that we’re all slip-sliding along: as with most things, there are no eithers or ors in the fertility world), you are sort of always dancing around the word. It’s always kind of there even when it is unsaid and medically inapplicable to your case. When I was in my third year at university, I became fascinated with the psychology of assisted reproductive technology and its relationship to women’s identities. For my final essay for a course in critical psychology, I interviewed a young woman who was an egg donor. Being that we were the same age, I was curious about the process she went through, but I was more interested in the people she donated to: what were their stories; what brought them to this seemingly extreme place; and, most importantly, was it really going to be worth it? Armed with my interview, and a few readings (it was an undergraduate course), I wrote a scathing feminist analysis (is there any other kind? ), decrying this relentless, expensive hunt for the ‘blood tie’, especially in a country like this one, where there are so many children, already born, already here, who have no one. It has occurred to me that this current journey is a bit of karma, delivered fresh by the Universe, to reinforce that old age life lesson of refraining from declaring any old thing until you’ve lived it. (I suspect it’s a lesson I’ll revisit time and time again in my lifetime.) At the time, I didn’t understand the imperative to conceive, and the particular pressures it put on women. I read them as the effect of society, that tells us from the time we emerge from our own mother’s wombs and are found to have wombs of our own that we are destined to be mothers. It is our birthright, it is a given. Budding, oh-so-young, feminist that I was, this was anathema to me: it felt part and parcel of the old bait-and-switch society pulls on women. Convince you that you are destined to be something, that it is interwoven into your biology (neatly reducing you to that biology), and then when it doesn’t happen (which it doesn’t and may not for many women, for countless reasons, amongst which is that some women choose other paths), you are blamed and labeled: barren, childless, and sometimes, infertile. So here I am, in the centre of my very own Universal karmic lesson, feeling the pull towards biological offspring, and resisting the dreaded ‘I’ word. I resist it because of all it signifies, but also because it deeply offends my feminist sensibilities. It assumes that this was destiny rather than deliberate choice, and now that it is happening (or not happening, as it were) with some effort, and in a decidedly non-destiny fashion, that there is something wrong with me as a woman and as a person. 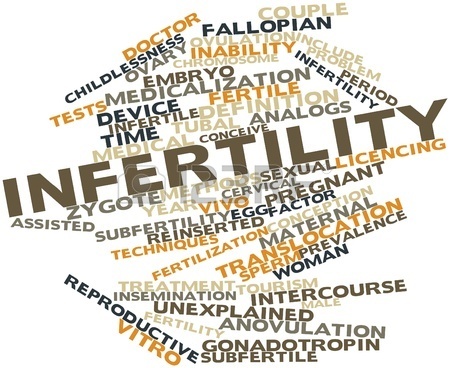 Like most aspects of the fertility (treatment) world, the word ‘infertility’ also threatens to turn this experience into one that is about the individual (the other ‘I’ word) and what my husband or I can do. My husband and I are reduced and separated: he is sperm, I am egg, and we are assessed and measured separately. We are in this vortex of hope, storing up futures and legacies to bestow upon this kid. The kid doesn’t exist yet, but the hopes and dreams and fears all do. And we circle the space to be occupied by the kid, doing everything we can to fill it. As committed as we are to the process, it often feels a self-centered journey, with its focus on what we want, and what we bring as individuals (how’s the sperm, have you dropped that egg this month) to make what it happen. Because nothing is given, no matter what society says, we started tentatively looking at adoption websites. Not because we’ve made a decision, but because I am determined not to continue to think of adoption as a ‘back-up plan’ or a ‘second choice’. As one of the websites we looked at correctly points out, as an adoptive parent, you are there to be a resource to this child, and not the other way around. I couldn’t live with myself if my child ever felt they were a last resort. Rather than positioning adoption as a last resort, we are actively keeping it on the cards, occupying equal head and heart space as the upcoming IVF cycle. And therein lies my biggest problem with the ‘I’ word. To accept the word ‘infertility’ in whatever form in which it comes (diagnosis or no) feels like giving in to so much more than ideas of barrenness and brokenness. It feels like surrendering this process to its worst parts: those parts of it that make you feel pathological, and sick when you cannot conceive immediately; those parts that turn a micro-lens inward, to the spaces we want to fill in ourselves and remove attention from the child and how much more than those spaces they will be. That’s why you don’t see or hear too much of that word round these parts, dear reader. That’s not going to change. What will change is how I approach the ‘I’ word. Instead of merely avoiding it, out of the fear of all it signifies, I will try to live this experience in defiance of it, reminding myself that our child is not my individual destiny, and will not exist (whether or not that existence is of me and my husband) in service to my hopes and dreams and identity as a woman.